Let's continue to take an in-depth look at how prophecies concerning Israel were fulfilled in the 20th Century and continue to be fulfilled to this day, particularly as they relate to the resurgence of the Israeli military. The prophet Ezekiel referred to the revival of Israel in the last days as producing "an exceedingly great army" (Ezekiel 37:10). Zechariah was more specific. He prophesied that God would make "the clans of Judah like a firepot among pieces of wood and a flaming torch among sheaves," enabling them to "consume on the right hand and on the left" all their enemies (Zechariah 12:6). He proceeded to state that in the end times, the nation will be so strong that the "feeble among them in that day will be like David, and the house of David will be like God, like the angel of the Lord before them" (Zechariah 12:8). The situation proved to be quite different in 1973 when the Arabs enjoyed the element of surprise. Egypt and Syria launched an all-out surprise attack against Israel on October 6, which happened to be Yom Kippur, the holiest day in Judaism. The Egyptians suddenly crossed the Suez Canal, quickly overran the Israeli outposts along the canal, and then drove deep into the Sinai before the Israelis could mobilize their forces, deploy them, and launch a counter-attack. Meanwhile, the Syrians had simultaneously attacked the Golan Heights. The war was prompted by a desire on the part of the Egyptian President, Anwar Sadat, to avenge the humiliation the Arab world had suffered in the 1967 Six Day War. Although Sadat warned repeatedly in 1971, 1972 and 1973 that he was going to renew the war with Israel, most observers remained skeptical. On the Golan Heights, approximately 180 Israeli tanks faced an onslaught of 1,400 Syrian tanks. Along the Suez Canal, fewer than 500 Israeli defenders with only 3 tanks were attacked by 600,000 Egyptian soldiers, backed by 2,000 tanks and 550 aircraft. Furthermore, at least nine Arab states provided aid to the Egyptian-Syrian war effort, including Saudi Arabia and Kuwait who served as the financial underwriters. Most important, the Soviet Union was heavily involved, providing military supplies, intelligence and diplomatic support. 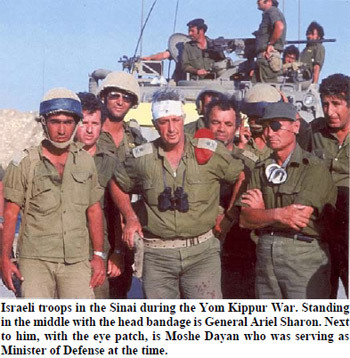 Israel prevailed because of massive aid from the Nixon Administration and because of brilliant generalship in the marshalling of its armies. The Israeli military leaders utilized this aid to stop the Syrians dead in their tracks on the Golan Heights, while General Ariel Sharon led the Israeli tank forces in the Sinai in a counterattack that resulted in the greatest tank battle in history. By October 15, the Egyptian tank force had been destroyed, and Sharon had crossed the Suez Canal. He quickly surrounded the Egyptian Third Army, immobilized it, and started marching toward Cairo. Meanwhile, in the north, the Israeli forces had cleared the Golan Heights, recaptured Mount Hermon and started driving toward Damascus. Israeli forces were 25 miles from Damascus and 63 miles from Cairo when the Soviets decided to pressure the United Nations into calling for a cease fire. Once again, Israel had prevailed when there seemed to be no hope. In the fifth segment of this series on the resurgence of the Israeli military as a sign of the end times, we will look at the evidence of the fulfillment of this prophecy through Israel's Operation Thunderbolt.